Recently, our seconded teachers finished producing and labelling some new kits and these are now available for borrowing through QM Loans. These new kits are External Features and Micro Marvels. 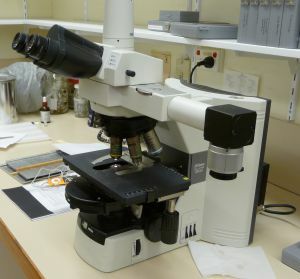 The first one is linked to Years 1 & 3, and the second one is targeted at Years 5 – 7 of the Biological Sciences strands of the Australian Science Curriculum. 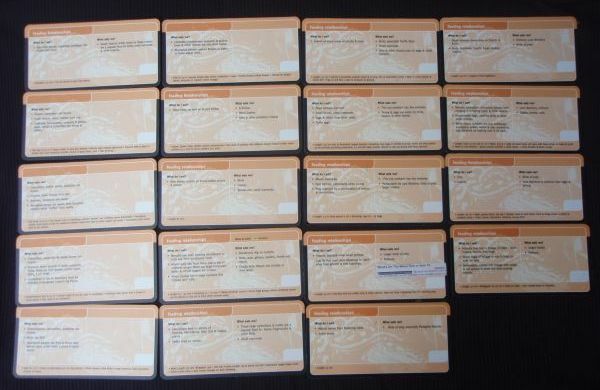 Teacher Resource Booklets have been produced for these kits. 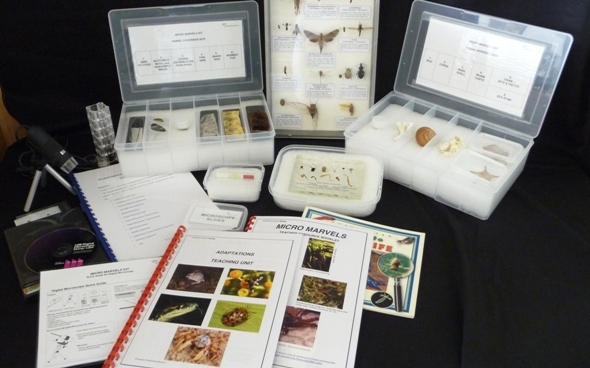 They include activities and worksheets that show how the objects and specimens in the kit can be used to teach the relevant aspects of the Australian Science Curriculum. 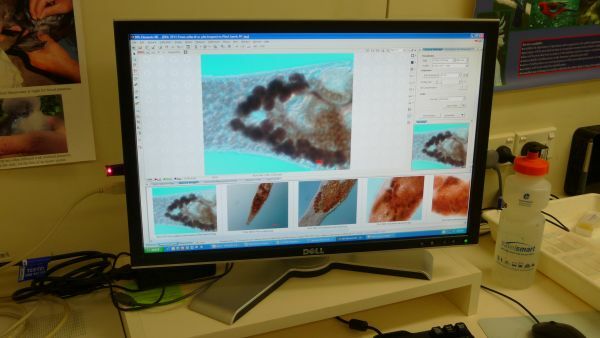 The Micro Marvels kit comes with a digital microscope and software. The External Features Teacher Resource Booklet and the Micro Marvels Teacher Resource Booklet have now been uploaded on to the QM website and can be found in the Learning Resources section. Resources are listed alphabetically so scroll down to the bottom of the page and navigate through the pages until you get to the ‘E’ or ‘M’ section respectively. 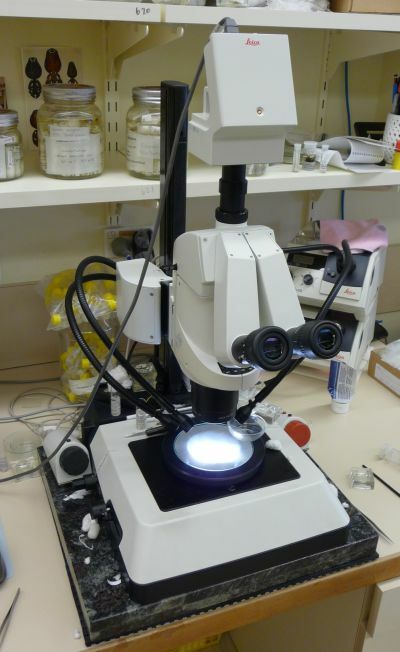 There are lots of other wonderful kits produced by QM Loans that address relevant aspects of the Australian Curriculum: Science and the Australian Curriculum: History. Curriculum-related materials are listed in the relevant categories on the QM Loans Catalogue Page. 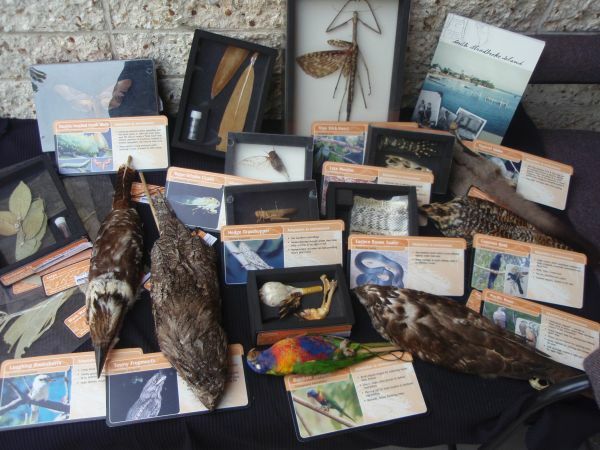 One of our premium kits is the What’s on the Menu kit which contains specimens collected from South Stradbroke Island. 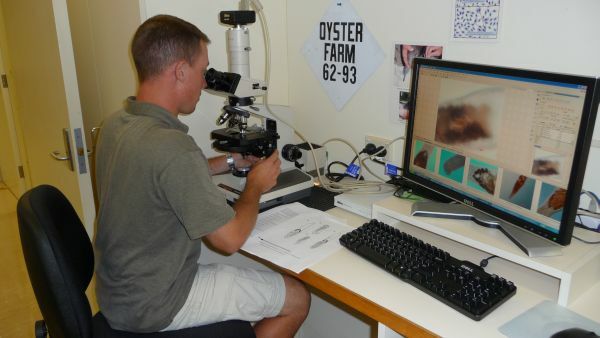 Included are plant samples, insects, reptile parts, and study skins of birds and mammals. 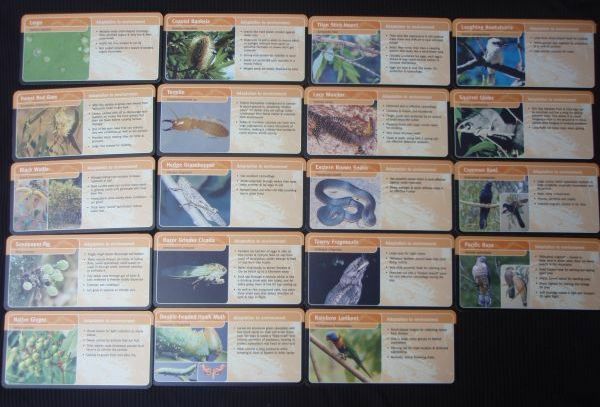 There are many activity cards and teachers can use these as the basis for group work within the class. 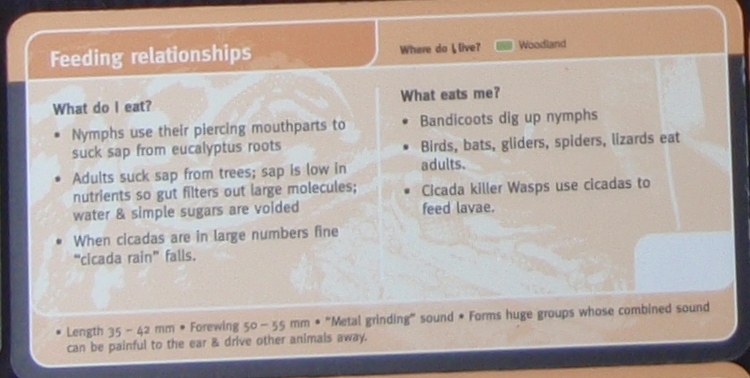 Students are challenged to discover the adaptations possessed by each specimen, examine life cycles, develop food chains, and investigate how these species interact with each other and their environment. With the school year winding down, now is an ideal time to review your borrowing needs for next year. If your educational institution is already a member, then now may be the time to renew your membership. 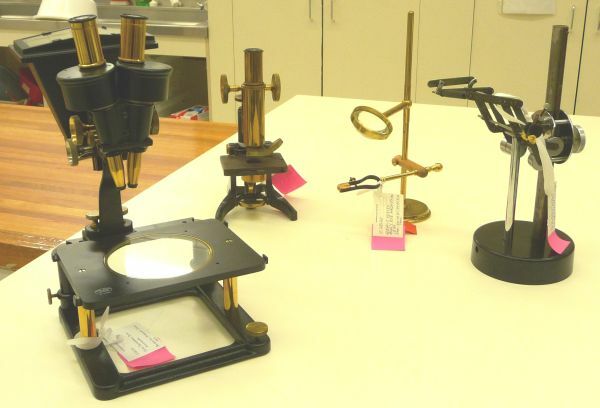 If you have not been a subscriber in the past, think about the advantages of borrowing kits, objects and specimens next year to enliven your Science and History classes. Information about Subscription and rates can be found on our QM website. Recently an adult Humpback Whale beached itself on North Stradbroke Island, just 1 km south of the Main Beach Surf Life Saving Club. 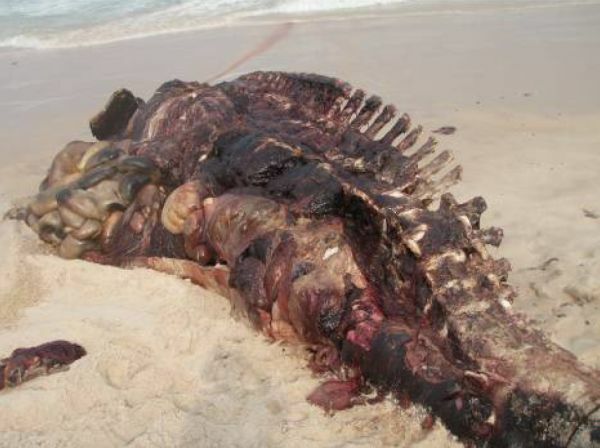 The cause of death is unknown though it may have been infection-related due to the snagging and embedding of a crab pot around the tail of the whale. 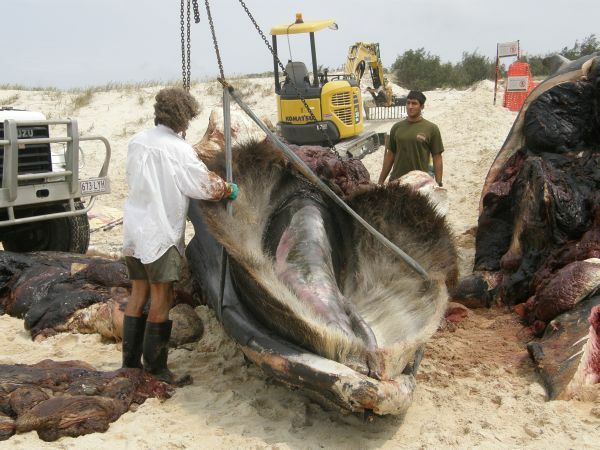 The 14.5 metre whale is a highly significant specimen. 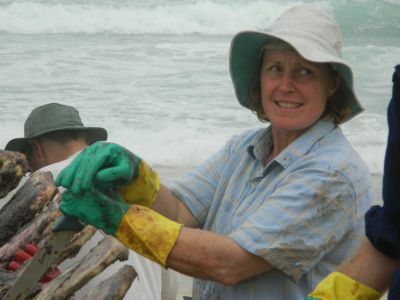 After many decades of attending whale strandings, it provided the first opportunity for QM staff to acquire an adult humpback skeleton and tissue samples. Senior Curator of Vertebrates, Dr Steve Van Dyck, said the whale skeleton had the potential to form the centrepiece of an exhibition in the future, and also be used for research purposes. Steve and Heather Janetzki (Collection Manager, Mammals and Birds) assembled a small team of QM staff and, with the assistance of University of Queensland Moreton Bay Research Station, DERM (Department of Environment and Resource Management) QPWS (Queensland Parks and Wildlife Service) staff, and representatives of the Quandamooka Land Council, they spent two days flensing and removing the skeleton for the State Collection. (Flensing refers to the removal of the outer blubber layer of whales.) Another day was taken to clean up the mountain of blubber and flesh that remained. The operation began by removing the lower jaw, then cutting wide incisions into the blubber and muscle then winching these great chunks off the animal to provide access to the neck, in order to cut the muscle away from the bones. A crane was used to roll the skull over. 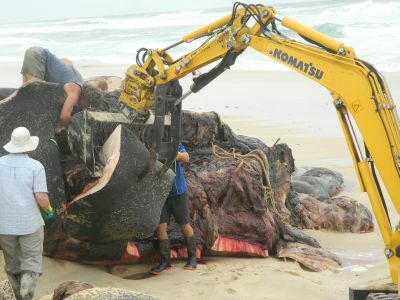 Then when it was released from any remaining tissue, it was dragged into a skip and from here pulled onto a 4WD truck. 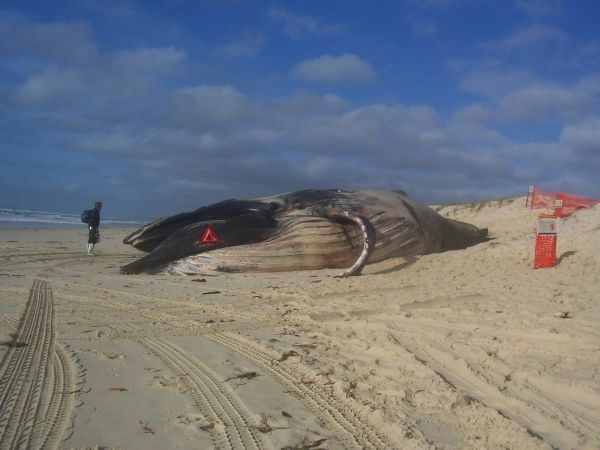 Although the whale had been pulled up the beach to the level of the dunes, there was concern among locals that blood and tissue would attract sharks to Stradbroke’s most popular surfing beach. The rest of the skeleton was retrieved by flensing the blubber off and cutting the muscle from all the vertebrae, using a winch and mini-excavator to pull the ribs out and cart the flesh away for burial. 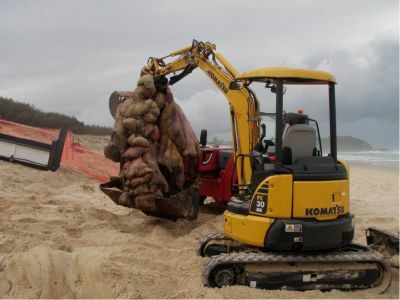 The skull and skeleton were transported across Moreton Bay to a paddock in Brisbane. From here the bones will be taken to the Museum and macerated in a large boiler for a few days, then dried out. The entire baleen sheets are being preserved. 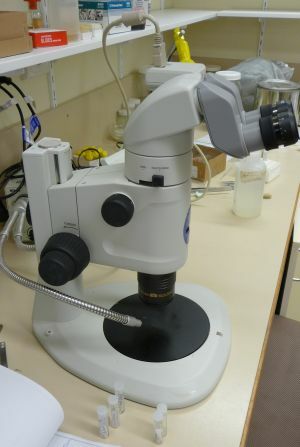 Some soft parts and contents of the digestive system were also collected for other researchers. Dr Van Dyck said the resulting skeleton was superb, complete and in very good condition. 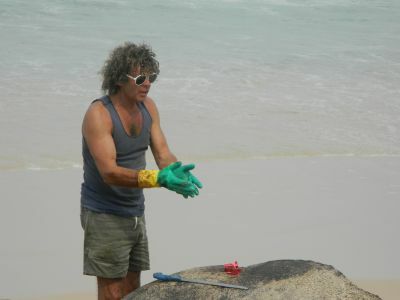 He and Heather are grateful to Tim Powell for transporting the skull and skeleton (separately) to Brisbane, to Stradbroke Ferries for waiving the barge fees to allow Tim to do this, to Geoff Pettingill for his gentle and expert excavator skills, and to Christine Durbidge for the cake she baked. To learn more about the work that Steve does visit his Biography Page and to learn about Heather’s job visit her Biography Page. To learn about the feeding adaptations of marine mammals, including how baleen plates function, view the Marine Mammals video. 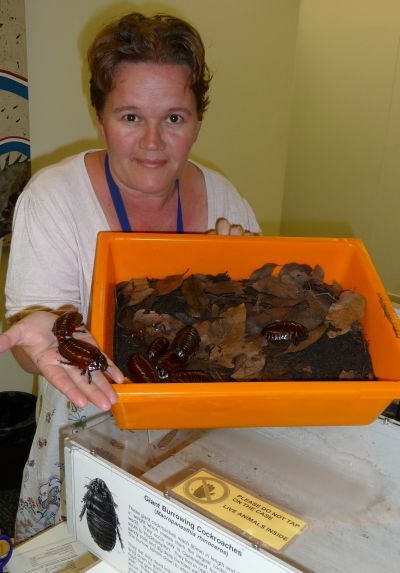 Last week some of our Giant Burrowing Cockroaches gave birth so we are proud parents here at Queensland Museum. Giant Burrowing Cockroaches are insects classified in the Phylum Arthropoda, Order Blattodea. They are native to Australia and found mostly in tropical Queensland. As their name suggests, these insects burrow down into the soil, often to a depth of 1 metre, where they establish their home. Inquiry Centre Support Officer, Anita Hughes is handling some of the adults in the image below and she has been ‘over the moon’ about our new acquisitions! 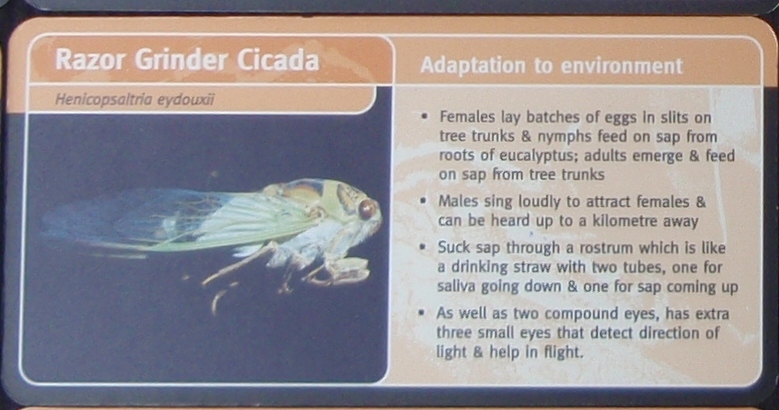 Males and females can be differentiated by the “scoop” on the head. Males have this scoop but females don’t. 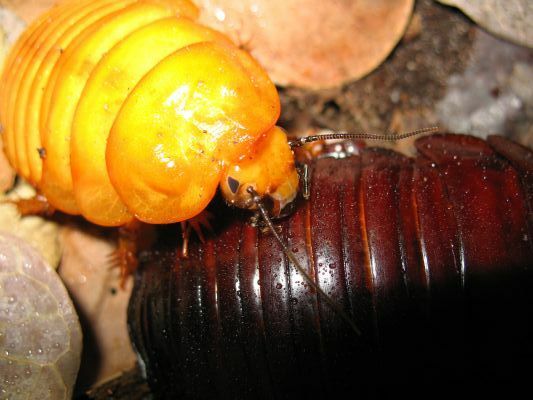 Unlike other cockroaches, Giant Burrowing Cockroaches are wingless and ovoviviparous. This means that embryos develop inside eggs that are retained within the mother’s body until they are ready to hatch. In addition to the birth of these ‘babies’, one of the adults has just moulted. 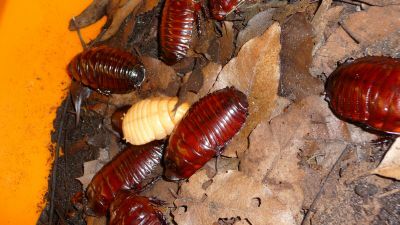 Many Arthropods, such as these cockroaches, shed their outer covering from time to time and this allows them to grow. 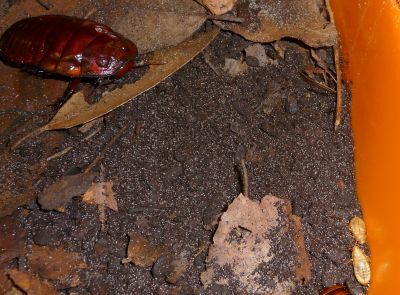 Burrowing cockroaches shed their exoskeleton 12 to 13 times before reaching adult size. This covering is made up of chitin, a polysaccharide which functions a little bit like the protein keratin. Exoskeletons assist with protection from pests and predators, support, feeding and reducing the amount of moisture lost by terrestrial organisms. 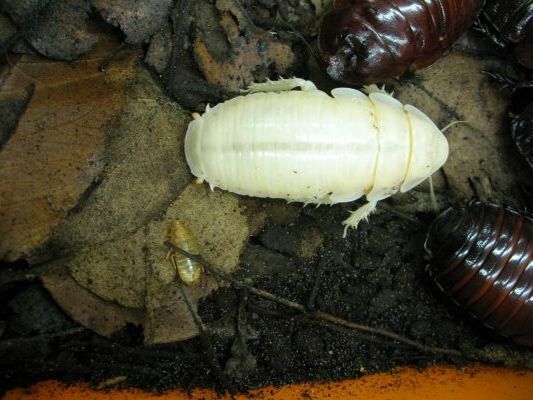 When the cockroach moults it appears pure white except for its eyes. By the next day, it has developed the normal brown colour of the species. Once the adult sheds its exoskeleton, it begins to consume the old ‘skin’. 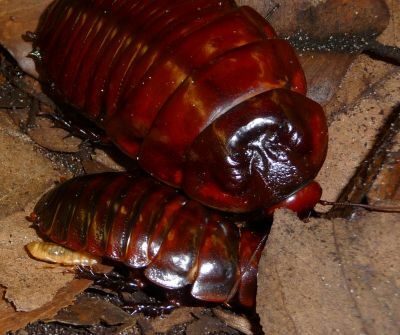 The exoskeleton is an important food source so newly moulted cockroaches and babies feed on this. 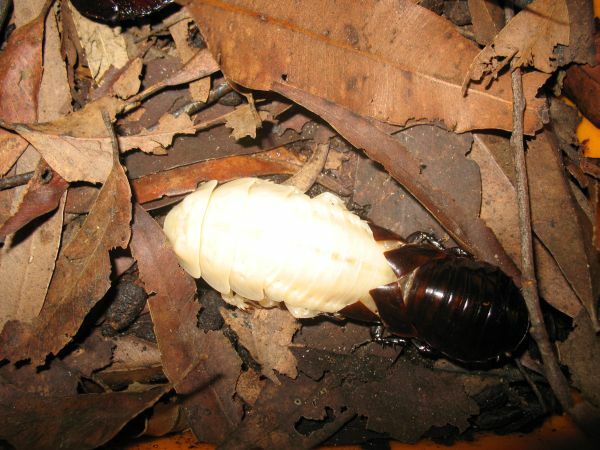 Cockroaches such as these perform an important role in consuming leaf litter, eucalypts in particular, and recycling the organic matter back into the ecosystem. 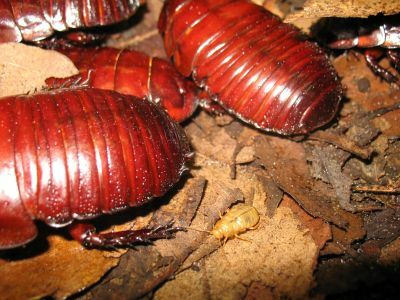 To learn more about these amazing animals, visit the Giant Burrowing Cockroaches section of our QM website.